How Do Strange, Scorching-Hot 'Vulcan Planets' Form? 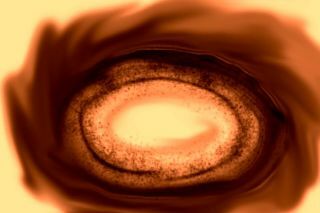 Artist's impression of the swirling inner region of a protoplanetary disk, where strong pressure gradients lead to the trapping of dust and pebbles and the formation of a Vulcan planet. The mystery of how blisteringly hot "Vulcan planets" form may now be one step closer to being solved, researchers say. In the past two decades or so, researchers have confirmed the existence of more than 1,800 exoplanets orbiting distant stars. These discoveries have revealed very different kinds of planets from those seen in the solar system, such as super-Earths, which are rocky worlds up to 10 times the mass of Earth. "Almost 99 percent of the Vulcans are on orbits that are smaller than Mercury's orbit," said study co-author Jonathan Tan, an astrophysicist at the University of Florida in Gainesville. "Some are 100 times closer to their star than the Earth is to the sun." Scientists have nicknamed these large, hot, rocky worlds "Vulcan planets." The name does not come from the home world of Spock's race in "Star Trek," but from the Roman god of fire, and it was also the name given to a planet that some astronomers had thought might exist inside Mercury's orbit in our solar system. The temperatures of Vulcans can be as high as about 1,340 degrees Fahrenheit (725 degrees Celsius), "similar to that of molten lava," Tan said. "Oceans of lava are a distinct possibility." These compact systems of Vulcan planets "appear to be very common," Tan told Space.com. "Perhaps most planets in the galaxy are found in such systems." However, explaining how Vulcan worlds could have formed remains a challenge for scientists. Some theorists propose Vulcan planets may have originated farther from their host stars, and each other, than they exist today. They would have then spiraled in to their present orbits, explaining what astronomers see now. However, some details of the spacing between these tightly packed exoplanets do not fit the pattern one would expect if this migration scenario were true. Another possibility is that Vulcan planets gradually formed where they are now from a disk of so-called planetesimals — rocks the size of asteroids and moons. However, to get Vulcan planets to form this way so near their stars, one would need disks of planetesimals at least 20 times more massive than the disk that gave rise to Earth and the other planets in the solar system — an unlikely scenario, researchers say. Recently, Tan and his colleague Sourav Chatterjee proposed a theory known as "inside-out planet formation" that may solve the mystery of how Vulcans take shape. It suggests that these worlds originated in the scorching-close orbits they occupy now from a stream of pebbles and small rocks that spiraled inward from more distant parts of their system. These stones accumulate in a ring around their star, and are kept from getting any closer by pressure forces in the inner disk around the star. "We hypothesize that a planet will eventually form from this ring and will keep growing," Tan said. Eventually, this planet grows massive enough to scoop up most of the matter near it, creating a mostly empty gap in the disk of gas and dust around the star. Pebbles and small rocks that continue to spiral inward from more distant parts of the system then form into a ring slightly farther away from the star, and this process of planetary formation begins anew. "Planets form sequentially, one after another, from inner orbits to outer orbits, hence 'inside-out,'" Tan said. In a new study of 629 Vulcan planets, the researchers now find that the greater the distance of these exoplanets from their parent star, the larger their mass. This matches a prediction of inside-out planetary formation. "I am very excited to see that the observations appear to match the prediction," Tan said. "This may indicate that we are on the right track in understanding how they formed." There are many aspects of this new theory that still need to be worked out in detail, Tan said. "One big question is why don't all disks form planets in this way — for example, why is our solar system different?" Chatterjee and Tan detailed their findings online Dec. 29 in the Astrophysical Journal Letters.